Congratulations to Professor Heinen for earning a Computer Science Education Grant! Congratulations are due Cañon City High School Computer Science Teacher Mark Heinen for earning a Colorado Computer Science Education Grant Program award. This will provide professional development from elementary through high school. Elementary and middle school technology teachers will attend hands-on workshops, coding seminars, and continuing education to increase their computer science knowledge while high school technology instructors will attend AP seminars and complete credited courses in programming. The grant will also help support after-school computer science clubs and activities, teachers learn how to code in at least one language, and support teacher competency in productivity applications, as well as utilizing and writing HTML. Thanks for your hard work on this Mr. Heinen! Fiona O'Dowd-White, a Cañon City High School Tiger Open Pathway student, has been promoting an interesting event she is coordinating. She is hoping to educate our community about student learning styles and how schools address them. As part of this work, she has arranged a public showing of the movie Most Likely to Succeed. This will take place on Thursday, April 19th at 6:30 PM in the Cañon City High School Auditorium. A well-deserved shout out goes to the Harrison staff for arranging college campus visits for students in grades 6 through 8. Counselor Sandra Seaney has been coordinating this effort and I have no doubt the experience will cause many of our students to deeply consider what life at college may look like for them. 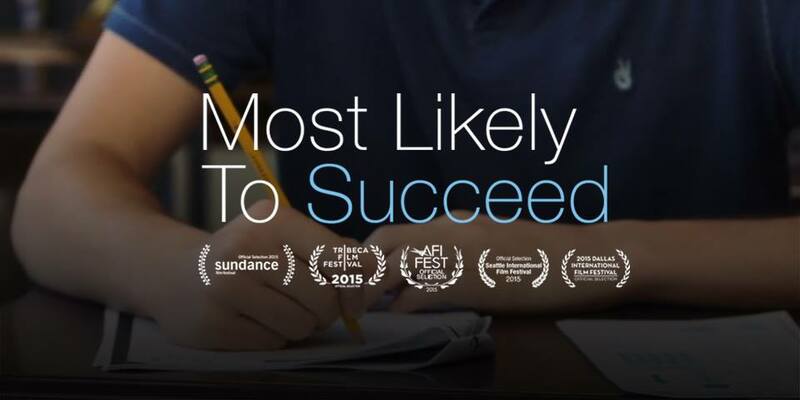 A student promoted viewing of the movie Most Likely to Succeed will take place on Thursday, April 19th at 6:30 PM in the Cañon City High School Auditorium. Cañon City Middle School students proudly display prizes earned for effort on state assessments. This week I completed our remaining principal evaluations, paving the way for contract renewals to be considered by the Board of Education. On Monday we'll begin certified master agreement negotiations by holding an all-day work session. That evening at a regular meeting the Board will consider Cañon City High School's proposal to adjust its start time by an hour and afterward board directors and key school and community personnel will conduct a School Safety Town Hall. Cañon City Schools does its best each year to encourage students to take state-required assessments seriously. Results of these tests determine school and district accreditation ratings. We believe accurate results allow us to determine what a kid knows and where they need to grow. Many of our schools create programs to incentivize student effort on these tests. I greatly appreciate this. Unfortunately, despite our best work to encourage students to do their best on this year's assessments, Cañon City Schools has experienced continuous glitches within the testing system. This has, no doubt, caused frustration among students and we are beginning to worry about the validity of their results. I just want to take a moment to thank our kids, and their teachers, for the patience they have displayed in their effort to show what they have learned. With staff devices in place and teachers diligently working through online professional development, our next big task is to hire an educational technology instruction coordinator. This position, funded through override proceeds, has already been posted and Director of Instruction Adam Hartman is putting together a selection committee. Roofers are making good progress on CCHS repairs. We are making quite a bit of progress on our multi-facility repair project. Panic button systems have been installed at Lincoln School of Science and Technology and McKinley Elementary. Installers are tuning the systems and children and staff are being trained on their use before they go live. McKinley and Cañon Exploratory School now have newly installed intercom systems and each staff is being trained how to use them. Important decisions about the replacement of potable water delivery systems at Lincoln, McKinley, and Cañon City High School have been made and now the big task is to secure labor to complete these installations over the summer. Roofers have started to coat the Tiger Dome, and will soon be moving solar panels off McKinley so they can begin roof repair there. Finally, key decisions have been made about how to increase safety at the main and art room entrances of Cañon City High School and architects have begun drawing those up for installation. Last Monday I traveled to Denver and back with Board President Larry Oddo to attend the Opportunity Coalition day at the Capitol. While there we observed the House Education Committee hearing on a proposed revised education finance formula. On Tuesday I held a Superintendent's Advisory Council meeting and conducted an expulsion hearing, then headed back to Denver for a Colorado Safe Schools Resource Center advisory board meeting. On my way home I stopped in Springs to attend a monthly Pikes Peak Alliance meeting. On Wednesday I began my day at a Harrison Building Leadership Team meeting, then held central office and operations staff meetings before attending a special board work session. I also held two principal evaluation meetings that day. On Thursday I attended a CCEA leadership touching base meeting, attended a student transfer meeting, held my final principal evaluation conference, then worked on BEST grant follow-up reports before attending the CCHS technology deployment committee meeting. Most of my day Friday was spent participating in phone interviews related to the search for a new Pueblo Community College Fremont Campus Dean. The Fremont County K-12 Student Art Show opened on Friday. This collection will be on display through April 27th. Monday is a marathon day as I'll start with an 8 AM to 4 PM certified bargaining session, followed by a board work session and regular meeting, and then a School Safety Town Hall. On Tuesday I'll touch base with Director of Student Support Services Paula Buser, attend a monthly CCPD meeting, hold a SAC meeting, attend a Design-Build team meeting, conduct a Leadership Team meeting, observe a TOP student project presentation, then hold a District Accountability Committee meeting. On Wednesday morning I touch base with CCESPA leadership, attend an Opportunity Coalition phone conference, host visitors from Cripple Creek Schools who want to learn about our override and bond projects and attend the opening performance of this year's spring musical. I'm taking a personal day on Thursday to spend time with my son who is visiting from Indianapolis, and on Friday I attend a regional superintendent meeting in Springs.